AirportLighting.com markets top quality lighting products from manufacturers who are the industry leaders such as: Crouse-Hinds, Amerace, Jaquith, Point Lighting, and Lumacurve. 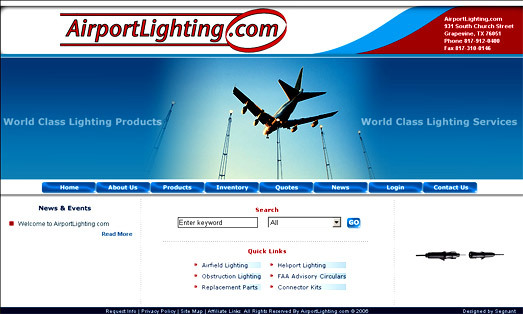 They understand the unique codes and requirements the FAA places on aviation lighting and AirportLighting.com will ensure all of their products will meet FAA specifications. 3. News - Ability to display News articles for easy viewing by users. Segnant created a website for Airport Lighting that allowed them a place to display their products and give more information to their customers.